Eggplant recipes help you enjoy this excellent cholesterol stopper. Eggplant recipes helps you enjoy this excellent cholesterol stopper. Eggplant recipes are really very easy and quick. They are deliciously simple. But I love them really because any food that tastes good, is healthy and can be prepared in a short time, is surely a winner! In Europe this page would be called how to cook aubergine. I do have to admit though, eggplant is a bit of an acquired taste. I'm glad I've acquired it - because then I can eat cholesterol-rich foods like butter that I love, without guilt. 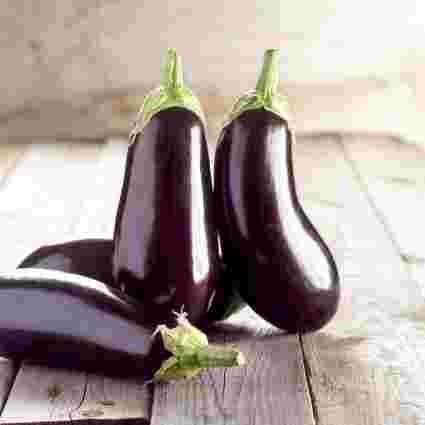 Eggplant counteracts cholesterol-rich food so we eat them at least twice a week. This page was last updated by Dr Barrie Lewis on 12th April, 2019. One glass of red wine, fatty fish like salmon and mackerel, omega-3 in freshly ground flaxseed, fruit, salad... so much to be done for high cholesterol that doesn't have the nasty side effects of statins. 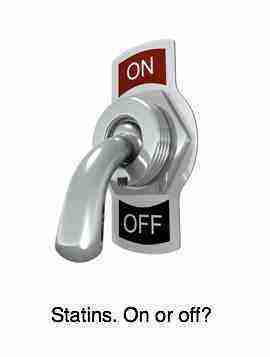 Suffering from impotence? One large or two small eggplant. One egg, lightly beaten; add a little water. All purpose flour in a soup dish. This is altogether the most delicious way to eat brinjals , as the Indians call eggplant. It originated in the Subcontinent apparently. Eaten as the side dish for a healthy salad, you need not feel guilty about the relatively high fat content of fried aubergine. Cut the eggplant into slices about 7-10 mm thick. No need to peel. Salt and wipe them clean after about 10 mins if you are feeling strong! 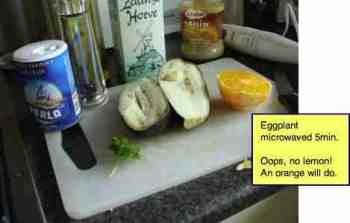 Especially if the brinjals are a bit old. It draws any bitter juices out, but frankly I don’t bother. Dab the aubergine slices (both sides) into the flour. Drop into the beaten egg-water mixture. 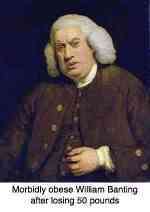 Pour a glass of red wine: CHOLESTEROL ALCOHOL One! A biggy! Drop the floured and egged brinjal slices into the hot oil and immediately turn the temperature down. Dribble a little olive oil onto the up side and flip the slices as soon as they are brown. Watch them like a hawk - they can burn very quickly. Salt them lightly. 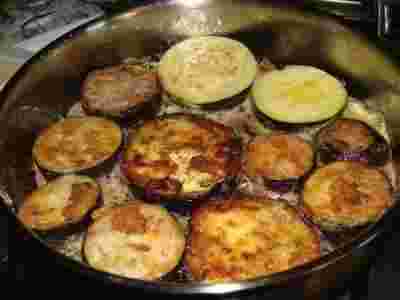 Fried eggplant recipe, a step by step guide with photos. For a variation, try this sweet and sour eggplant. Fry your brinjals as above. Then make up this sauce. Pour your sauce over the hot fried eggplant slices and allow to cool. I particularly like them still slightly warm on a thickly buttered slice of our vegan seed bread. You can also make an eggplant salad with fried white fish for a variation; then it's a whole meal. Coat your fish fillet with olive oil and sizzle in a hot pain for not more than ten minutes. On a white plate to give nice contrast, place the fish and cover with the sweet and sour eggplant; sprinkle with finely chopped cilantro. Google appears to frown on too many links, so phrases in bold, like that vegan seed bread above, need to be put into the Site Search function in the navigation bar on your left if you want more information. Your fried eggplant recipe is quite rich, but because of the special cholesterol binding properties of the aubergine, and the anti-cholesterol properties of olive oil, you needn't worry. Still, all fried food is quite high in calories, so it's best enjoyed with a salad sidedish. 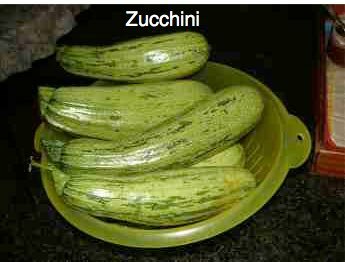 Zucchini, depending on size, 1 or 2. 1 Paprika*, sweet pepper, sliced, + slither of chili. Lightly fry the onion in a heavy saucepan in a little olive oil. Throw in the rest of the ingredients, and salt and pepper to taste. Cover and simmer for 45 mins on low heat. Delicious on a bed of brown rice (throw in a handful of lentils for LENTIL PROTEIN. Growing zucchini is really very easy in summer. Previous studies have suggested a role for plant compounds in lowering cardiovascular risks including hypertension (high blood pressure). In a new study, researchers found that long-term consumption of chili peppers reduced blood pressure in hypertensive rats. The substance capsaicin improves vaso-relaxation and helps prevent hypertension. Google appears to frown on too many links, so phrases in bold, like that how to grow chilli and vegan seed bread above, need to be put into the Site Search function in the navigation bar on your left if you want more information. Peppers, whether the spicy, red-hot chili or the bell pepper are particularly rich in substances called phyto-chemicals. There are thousands of them, and researchers are now coming up with heaps of evidence about their anti-oxidant and cancer-preventing properties. For example, you may have heard of lycopene, the photochemical in tomatoes that prevents prostate cancer. Beta-carotene is another well known phytochemical. It's the precursor to vitamin A and gives carrots their orange colour. You may be wondering: Why eggplant recipes and all this talk about phytochemicals on a chiropractic website? Chiropractic is much more than having your spine well-adjusted. Whilst we spend our hours freeing up subluxations, we know that to keep our patients healthy and happy we have to emphasize healthy diet, the body in motion, the alert mind, and if you want to think about truly abundant living, then of course the spirit too. Cut into thick slices (with their skins), dab into the lemon juice, and then the cake flour. Fry in hot olive oil, and a little butter, until golden brown. Careful, they burn easily! Separately, lightly fry the onions and garlic until translucent. Layer the eggplant, onion mix and cheese into an ovenware dish. Pour the juiced tomatoes over the dish and bake in a hot oven for 20 mins. Eggplant recipes are delicious and known for their cholesterol-lowering properties. Enjoy! 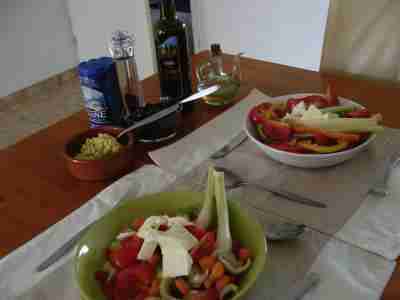 Greek cooking of course is not only about Aubergines/ eggplant, but also healthy delicious olives. Olives contain mainly monounsaturated oils, which have been shown to decrease bad LDL fats, and increase the good HDL fats. They also have a natural anti-inflammatory ingredient. For more about FIVE MINUTE olive pate dips to go with your eggplant recipes, click here, olive pate. Know what that is? If you visit Stockholm, after supper you will see the Swedes out window shopping and strolling the city streets deep in conversation. They swear it helps the digestion, and they sleep better. For more about the benefits of walking, click here for WALKING BENEFITS. You will need to buy sesame paste (tahini), or make tahini. If you love eggplant recipes then there are enough at "Well-being secrets" to keep you busy all summer! Share in Helen Nichols' passion for this fruit at eggplant brinjal curry.